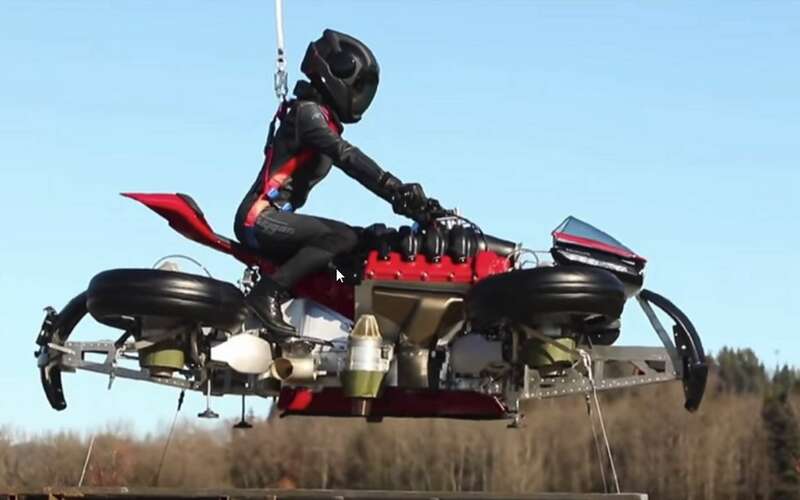 The French trainer Lazareth unveiled a video of his flying engine that hovered a meter above the ground. The LMV 496 will soon be available for pre-order. It is necessary to offer a six-digit check to offer it. At the end of December, Lazareth unveiled his incredible concept of flying motorcyclethere was something to be surprised and a little vigilant. Indeed, the machine with turbines built into the four castors was not shown in action. It is now ready and we can say that the LMV 496 is flying. Or at least she can take off. We discover this spectacularly in a new video motorcycle quadricycles mounted on independent swing arms that can move away from the chassis and can turn to a horizontal position in a dr. The LMV 496 gets off the ground and stays in it float about a meter, which is already a great technical achievement. The turbines supplied by Jetcat run at 96,000 rpm. It takes approximately 60 seconds to preheat before departure. The LMV 496 is equipped with an electric motor for driving on the road and a heat motor for supplying power to the turbines. According to an BMFTV article, the flying motorcycle weighs 140 kg, can carry a ton and generates a thrust of 240 kg in flight. of the parachutes Ballistics is integrated in every wheel. " It is an electric motorcycle that is approved to roll on the road and turns into a drone Said Ludovic Lazareth to our fellow brothers. To drive it, you need a large cube motorcycle license and a ULM pilot license. Because yes, Lazareth is planning to launch the LMV 496. The pre-orders will be open from October at the time of the Gitex exhibition in Dubai, where the flying engine will be presented. The price: 496,000 euros. Only a privileged happier and daredevil will be able to afford this device worthy of a sci-fi movie. On January 31, the French manufacturer Lazareth promises to reveal a flying motorcycle that looks incredible. It is equipped with four wheels with turbines and can be swiveled horizontally before the start. The term flying engine has recently become a bit of all sauces to qualify new flying machines. It was also used to talk about the Hoverbike intended for the Dubai police only for the Kitty Hawk Flyer which frankly has nothing to do with a motorcycle … But this time it's promised, we'll talk about a motorcycle that literally flies. At least that promises the French brand Lazareth. This Annecy-le-Vieux car, bicycle and tricycle driver, born in 1998, is known for his spectacular creations powered by Ferrari, Maserati or BMW engines. And Lazareth goes a step higher in the unlikely by announcing the presentation on 31 January of a real flying motorcycle, the video below gives us an overview. The four-wheeled LMV 496 appears to be designed on the basis of a Lazareth LM847. The wheels are mounted on independent swing arms that can move away from the chassis and turn to place them horizontally in a hoop-like configuration. In the center of each rim, a reaction turbine that points to the ground before the start. The video shows the ignition of the turbines, but we don't see the engine flying in the tunes. The propulsion system is supplied by Jetcat, which in particular emits the jet turbines of the X-56A aircraft nasa and also equips the Swiss rider Yves Rossi alias Jetman. Until the end of January to discover this Lazareth LMV 496 in more detail!